Just before the launch of its newest flagship phone, the Galaxy S IV, Samsung finds its New York marketing campaign "interrupted" by LG. 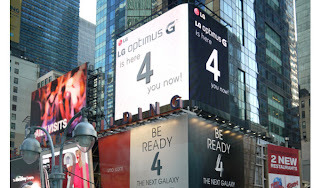 In bright billboards right above Samsung's, LG smartly placed messages saying that the "LG Optimus G is here 4 you now!". It seems that LG might've taken a page out of Samsung's book, as they commonly use "The Next Big Thing is Here" just before iPhone launches.